India needs a second States Reorganisation Commission. And it needs to split up its most populous state into smaller, manageable states. Full text of the 34th CD Deshmukh Memorial Lecture, titled Deshmukh, the Reorganisation of states and thereafter, delivered at India International Centre, in New Delhi on January 14, 2019. Chintaman Dwarkanath Deshmukh was one of India’s most distinguished economic administrators and public personalities. He had a brilliant scholastic career. He was the first Indian Governor of the Reserve Bank of India and was India’s third finance minister between 1950 and 1956. Deshmukh resigned from Jawaharlal Nehru’s Cabinet in July 1956 over the report of the States Reorganisation Commission and the position taken by Nehru’s Cabinet on the issue of Bombay city. This evening I want to revisit this all-but-forgotten chapter of our nation’s political history, discuss its background and context and use that flashback to highlight some contemporary issues surrounding our present political geography. In 1920 at its Nagpur session, when Mahatma Gandhi established his supremacy over our freedom movement, the Indian National Congress formally made a commitment to the linguistic reorganisation of what were then called provinces. But twenty years later on the eve of the Jaipur session of the Indian National Congress in December 1948, the Dar Commission set up by the Constituent Assembly submitted its report in which it came out strongly against the formation of provinces exclusively or even mainly along linguistic considerations. It highlighted that the nation faced larger national challenges of higher priority. In this, the Dar Commission was echoing the strongly-held views of every single key personality of the Constituent Assembly, including Nehru Sardar Vallabhbhai Patel Patel, Dr Rajendra Prasad, Maulana Abul Kalam Azad and Dr BR Ambedkar. C Rajagopalachari who was then the governor general was also of the same opinion. At the Jaipur session, the Indian National Congress set up a three-member committee comprising Nehru, Patel and Pattabhi Sitaramayya, the incoming Congress President, to examine the Dar Commission report and make recommendations to the government. This has come to be known in history as the JVP Committee, after the first letter of the first name of the three members. In the last days of March 1949, Nehru personally wrote up the JVP Committee report which, while not advocating large-scale linguistic reorganisation, made special mention only of Andhra and recommended its creation but on the condition that its protagonists abandon their claims to the city of Madras. In this, Nehru was undoubtedly mindful of the strong sentiments of Rajaji (as C Rajagopalachari was called) himself who was first governor general and later chief minister of Madras state. For almost three years there was protracted correspondence between Nehru and Rajaji who were then extremely close to each other not just personally but also politically. Let me fast forward to October 19, 1952 when Potti Sriramulu an energetic follower of Mahatma Gandhi announced a fast-unto-death in Madras city for meeting two demands: carving out an Andhra state from the state of Madras comprising its Telugu-speaking areas and making Madras city the joint capital of the two states. The immediate background to Sriramulu’s fast appears to have been Rajaji’s proposal to divert the waters of the Krishna to Madras. Nehru turned down this proposal but Andhra leaders led by Tanguturi Prakasam were incensed by Rajaji’s attitude and actions. The President, Dr Rajendra Prasad had first put the idea of such a commission in Nehru’s mind. 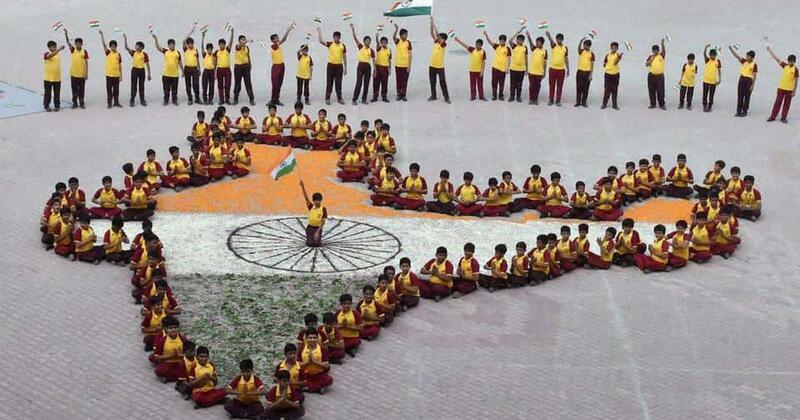 On October 1, 1953 the new Andhra state – the very first linguistic state in the country – came into being. 1953: Andhra Pradesh is separated from Madras. Two months later on December 23, 1953, Nehru made a statement in the Lok Sabha announcing the appointment of a States Reorganisation Commission to examine “objectively and dispassionately the question of the reorganisation of the States of the Indian Union so that the welfare of each constituent unit as well as the nation as a whole is promoted”. Members of the commission – Justice S Fazl Ali, HN Kunzru and KM Panikkar – were selected by Nehru personally and received detailed letters of invitation from him to serve on it. There was minor flutter when Fazl Ali in his letter of acceptance referred to the proposed body as “the Boundary Commission”. Nehru promptly corrected him and reminded him that he was accepting “the Chairmanship of the Commission on the reorganisation of states”. 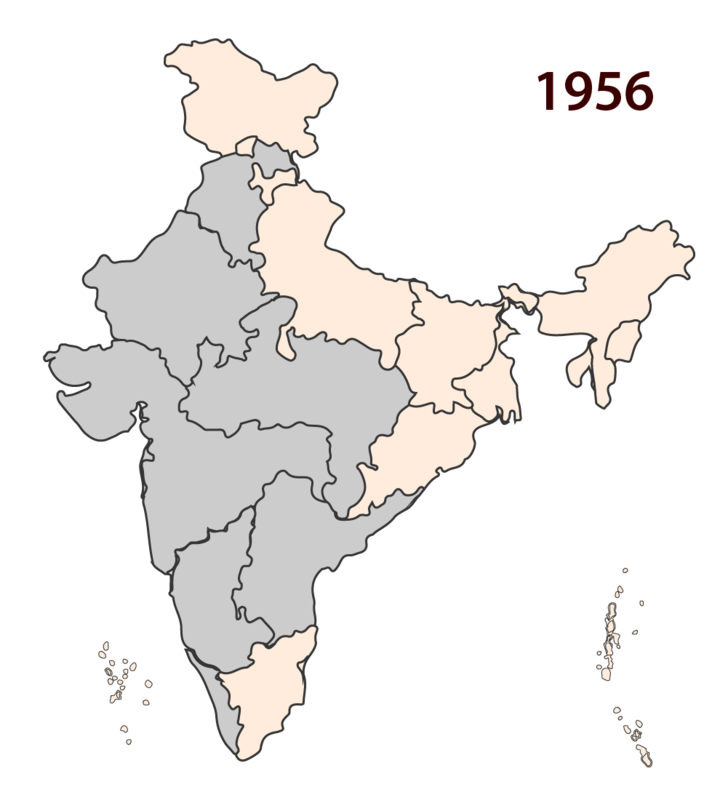 1956: States across India are reorganised. The States Reorganisation Commission submitted its report on September 30, 1955. It pleased nobody and led to agitations in large parts of the country. Three of its recommendations were particularly controversial. First, the proposal to create a bilingual Bombay state; second, the proposal to continue with the separate state of Hyderabad; and third, the proposal to continue with Punjab as a bilingual state. I will deal with each of these in some detail. The States Reorganisation Commission recommended the creation of a new bilingual state of Bombay comprising of today’s Maharashtra and Gujarat and also the creation of a separate state of Vidarbha. Both Nehru and Deshmukh supported the idea of a composite, bilingual state. Many Congress leaders of Maharashtra, however, opposed this recommendation vociferously and in deference to their demands, two months later the Congress Working Committee rejected the States Reorganisation Commission’s recommendation and suggested to the government that three states be created – first, Maharashtra that included Vidarbha, second Gujarat and third Bombay which would be centrally-administered with provision for a review after a period of five years. Your reference to Morarji Desai distressed me. It is not necessary to agree with a person in everything in order to recognise the person’s worth. I do not agree with some of the views of Morarji Desai. But in my larger acquaintance in India I know of very few persons whom I respect so much for their rectitude, ability, efficiency and fairness as Morarji Desai. On April 18, 1956 the States Reorganisation Bill was introduced in the Lok Sabha and it was immediately referred to a Select Committee chaired by the home minister himself. Two days later Deshmukh once again sent in his resignation to Nehru since the Bill had not made changes regarding the status of Bombay city along the lines being demanded by him. The very same day Nehru replied and once again talked Deshmukh out of resigning asking him wait till the report of the Select Committee was submitted. It is with deep regret that I have listened to the statement made by my honourable friend and my colleague in government till yesterday. I regret having to part company in the work of government from a valuable colleague. …..I am reluctant to enter into a controversy, which to some extent has a personal character. Since we are ending our close association as members of government, I should like this parting to be with goodwill. Sadly, while Nehru and [Home Minister Govind Ballabh] Pant went out of their way to be gracious to him, Deshmukh did not fully reciprocate. The Bill came up for discussion in the Lok Sabha in the late July and early August 1956 over a period of six days. Deshmukh and Pant had sharp exchanges and I am afraid Deshmukh does not come out well in them. In his speech Deshmukh observed that Pant had said that the Marathas have valour and the Gujaratis have sagacity. Therefore, Deshmukh went on to say, that the home minister had, by implication, classed Maharashtrians as non-sagacious. Pant took umbrage at this and went on to quote from the official records to highlight what he had actually said which was this: “the Gujaratis and the Maharashtrians complement and supplement each other’s qualities. One has more of valour, and, perhaps the other more of discretion. But all have to go together….” Deshmukh did not stop. Alluding to Pant’s origins he went to say that “Sagacity left Maharashtra when a certain family of Maharashtrian Brahmins left Deorukh in Ratnagiri 250 years ago”. Pant did not take this lying down and thanked Deshmukh for reminding him of his connection to Maharashtra and for telling the Lok Sabha that Pant had some little strain of Maharashtrian blood in him too. What happened to the government’s trifurcation proposal in Parliament was truly amazing and is completely forgotten now. It is worth recalling given the manner in which legislation has been passed– or not passed – in recent times. It got modified and by the time the debate ended the Lok Sabha had agreed to a composite, bilingual state of Bombay – something that Nehru and Pant had wanted in the first place. This happened because of an amendment to the Bill moved on August 2, 1956, quite extraordinarily, by two Independent Members – Frank Anthony and Tulsidas Kilachand Seth – which was supported by many others including Acharya Kripalani, Asoka Mehta and Deshmukh himself. Needless to add, it was enthusiastically embraced by Nehru and Pant as well. 1960: Maharashtra and Gujarat are created. The amendment was exactly what the States Reorganisation Commission had originally recommended with the only difference being Vidarbha would now be included in the composite state. Deshmukh himself was never against a bilingual state and hence what came out finally after the Lok Sabha debate was not something he did not approve of. But he had already resigned and had unnecessarily needled both Nehru and Pant by his intemperate language in the debate. But he did score a minor victory of sorts in his battle with Morarji Desai who was shifted to the Centre in 1957 to be replaced by YB Chavan. The composite state of Bombay lasted just four years and after prolonged agitation Maharashtra and Gujarat came into being in May 1960 with the city of Bombay being made the capital of Maharashtra. Lanka Sundaram: Is it Andhra Desa or Andhra Pradesh? Pant: It is either Desh or Pradesh; but it is not Pardesh.. Regarding Punjab, right through his tenure Nehru resisted the clamour for a Punjabi Suba believing that this was essentially a religious demand packaged as a linguistic issue. In this his natural instincts were reinforced by what Pratap Singh Kairon was telling him. In a letter to Nehru of November 22, 1955 Kairon had mentioned his conversation with Tara Singh in which the Akali leader had told him that he was spearheading the demand for a Punjabi Suba to retain Sikhi or the Sikh religion and if he became quiet for six months, nobody would have any keshas or long hair left. The next day, an Akali delegation led by Tara Singh met with Nehru, Pant and Maulana Azad seeking a Punjabi-speaking state. If you look at the Punjab from the linguistic point of view, from the point of view of numerous proposals made, you will find that there is no proposal conceivable which makes the Punjab completely unilingual, that is to say unilingual in the sense that the entire thing is based on Punjabi in the Gurmukhi script. So far as the speaking part is concerned , it might well be said that nearly all Punjabis speak Punjabi, whatever they might say. In fact, even Hindi or Urdu is half Punjabi, so that, if you look at it from a communal point of view, it is a bad attempt. It does not matter how much you may divide Punjab but the Hindus and Sikhs are intermixed completely. …Master Tara Singh came to see me. It was more of a social call than anything else, although he referred to the Akalis joining the Congress. He wanted the Akali Dal to retain a certain individuality in case necessity arose……I think on balance it would be a good thing for the Akalis to join the Congress. There are some risks of course, but we have to take them. This is the only way gradually to eliminate this communal outlook…. …So far as Master Tara Singh is concerned, naturally I regret his fast and I have requested him more than once to give it up. But his fast, I am sure, has nothing to do with language. In fact, he has said so quite clearly. He is out to preserve his Panth even though nobody is attacking it…His demand is a pure communal one, however he might try to cover it up. 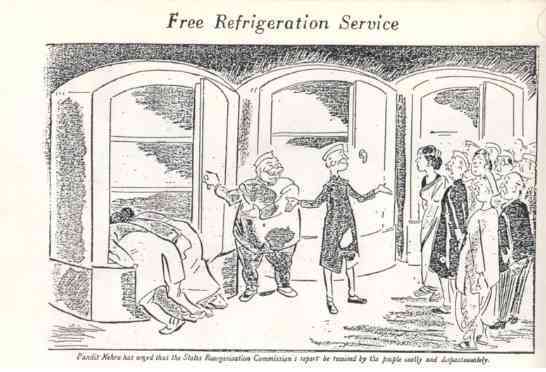 The issue kept simmering till Nehru’s death. It was one of the important reasons why the National Integration Council was set up in October 1961. After Nehru’s passing away, Indira Gandhi was asked to deal with it along with Swaran Singh as a member of Shastri’s cabinet and it was left to her to agree, in just about 10 months after she had become prime minister for the first time in January 1966, to the formation of Punjab and Haryana as separate states and to the creation of an expanded Himachal Pradesh. 1966: Punjab and Haryana are separated. She imposed President’s Rule and sent Dharma Vira the Cabinet Secretary as governor of the-then Punjab in June 1966 so that the reorganisation could be effected relatively smoothly. Many years later Dharma Vira was to write in his memoirs that ironically the reorganisation benefited those who were not in the agitation for the reorganisation. Indira Gandhi defused the Punjab situation but she was confronted with a new crisis in the state of Andhra Pradesh. First in the late 1960s there was a widespread agitation for separating the Telangana districts and reverting to the situation that existed prior to 1956. When she had succeeded in dealing with the Jai Telangana movement with some deft political moves helped considerably by her Home Minister YB Chavan, a Jai Andhra movement confronted her. This time instead of the Telangana region wanting to separate, it was the non-Telangana Andhra region wanting to go its own way without Telangana in its fold. Indira Gandhi advised largely by PN Haksar took an uncompromising stance and made it clear that whatever had to happen would have to be in the framework of the single, unified state of Andhra Pradesh. Incidentally, one victim of the Jai Andhra movement was the-then chief minister of the state who 19 years later went on to become prime minister of India – PV Narasimha Rao. ….Finally, the more I have thought about it, the more I have been attracted to something which I used to reject seriously and which I suppose is not at all practicable now. That is the division of India into four, five or six major groups regardless of language but always, I will repeat, giving the greatest importance to the language in those areas. I do not want this to be a thing to suppress language but rather to give it an encouragement. That, I fear, is a bit difficult. We have gone to too far in the contrary direction. But I would suggest for this House’s consideration a rather feeble imitation of that. That is whatever final decisions Parliament arrives at in regard to these states, we may still have what I would call zonal councils.. To begin with, I would say that it should be an advisory council. Let us see how it develops…. There can be , let us say, five such zonal areas…. 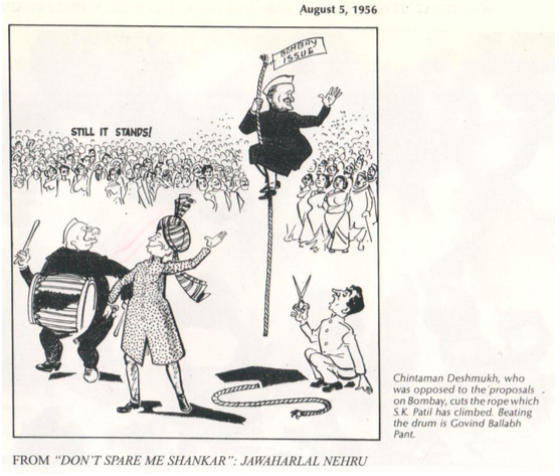 Nehru’s idea evoked support from even his political opponents in the Lok Sabha – like HV Kamath. But it went nowhere except in one specific instance. The States Reorganisation Commission report had displeased Bihar Congressmen who were unhappy that parts of that state were recommended to be part of West Bengal. It had also displeased West Bengal Congressmen and Communists as well who were unhappy that their state had not been give enough territory. Consequently, on January 23, 1956 after a meeting, Dr BC Roy chief minister of West Bengal and Sri Krishna Sinha the chief minister of Bihar issued a joint statement proposing the merger of West Bengal and Bihar to form a single state. However, the statement admitted that the “full details of it [merger] will have to be carefully worked out, the people concerned will have to be consulted and an atmosphere of voluntary reunion and cooperation has to be created”. Nehru took the idea seriously as also the suggestion of Roy that the word “union” be used instead of merger which had created serious misgivings in West Bengal A few days later Nehru prepared a detailed note titled “Proposed Union of West Bengal and Bihar” which was discussed by both the chief ministers with different political parties in their respective states. But following the defeat of the Congress in the Parliamentary by-elections in Midnapur and North Calcutta, Roy issued a press note on May 4, 1956 withdrawing the proposal of the union of West Bengal and Bihar, treating the election result as a people’s verdict against it. This was not the only merger or union proposal. Dr P Subbaroyon, an eminent Member of the Rajya Sabha wrote to Nehru on February 2, 1956 suggesting the formation of one single state comprising Mysore, Karnataka, Kerala and Madras. Nehru replied a day later expressing his worry on the prevailing “linguistic fanaticism” and while welcoming the suggestion acknowledged that there was opposition to it too. Earlier some time in October 1955, Krishna Menon had written to Nehru arguing that a separate Tamil province would be very anti-national while the separate Kerala state would doubtless go Communist after the next general elections and adding that “we will balkanise India if we further dismember the states, instead of creating larger states’’. Interestingly, Menon accused KM Panikkar for the States Reorganisation Commission’s recommendation for separate Kerala and Tamil states. …The national integration that you have been contemplating must necessarily include a rethinking about the linguistic distribution of states. As far as I can see considerable thought has to be bestowed on whether any scheme can be devised to reduce isolation of the linguistic states throughout India. Some time or other this has to be gone into…. …..I must say that I am rather taken aback by your new suggestion, that is, to change the present boundaries of our States. It was bad enough to do this once. To uproot everything and start afresh would be tempting fate. On the whole, our States have settled down and there is no particular reason why they should be unsettled. Such an Inter-State Council was to be set up only in May 1990 based on the acceptance of a recommendation in this regard made by the Sarkaria Commission on Centre-State relations. But it has remained a moribund body. In any case, Rajaji was referring to the resolution of issues between states and there is still an institutional vacuum in this regard. It is clear that Nehru’s position on the issue of linguistic states evolved. With the benefit of hindsight it may appear that he prevaricated a bit too long but such criticism ignores the larger political context of those early years – an India emerging from the trauma of Partition, an India making the transition to a republic based on a written Constitution, an India dealing with Communist violence in some parts of the country and of an India wanting to establish the foundations of economic development with undivided attention. Robert King has dealt with this issue very sensitively in his classic Nehru and the Language Politics of India which should be read by anyone interested in how language politics rocked our fledgling republic in the fifties and how Nehru dealt with it, changing his mind often, listening intently to vastly different perspectives and frequently accepting views that went against what came to him instinctively. “..More important than consistency is responsibility…A responsible person must have the courage to rethink and change his thoughts”. The first wave of the reorganisation between 1956 and 1966 created linguistic states in southern, western and northwestern India. A second wave in the very early 1970s redrew the map of the country in the northeastern region with the creation of Arunachal Pradesh and Mizoram as a Union Territories, the formation of the hill state of Meghalaya and the upgradation of Manipur and Tripura from being Union Territories to being full-fledged states. This second wave was anchored in ethnic, political and strategic considerations with language playing no role whatsoever. 1972: North Eastern states are created. A third wave blew across the country during the prime ministership of Atal Bihari Vajpayee in the year 2000 when the states of Uttar Pradesh, Madhya Pradesh and Bihar were bifurcated to create the new states of Uttarakhand, Chhattisgarh and Jharkhand. To be sure, there were movements for the creation of these new states with the demand for Jharkhand particularly having had a long history among the tribal communities in that region. The British scholar Louise Tillin is among the very few scholars to have studied this third wave in significant detail. Her book Remapping India came out four years back. She came to the conclusion that the creation of these three states was part of the larger social agenda of the RSS and the political strategy of the Bharatiya Janata Party to expand its support base among tribal and Other Backward Class communities. But what is interesting in this episode is that Madhya Pradesh and Bihar were ruled by non-BJP parties in 2000 and both went along without any murmur with the creation of Chhattisgarh and Jharkhand. In fact, the Madhya Pradesh state assembly passed a resolution in favour of a separate Chhattisgarh state much earlier, in 1994, when the Congress was in power in the state. As far as Bihar is concerned, it bears recollection that way back in the mid-1970s, Jayaprakash Narayan had advocated the formation of Jharkhand, something political leaders of the state, all products of the JP movement, would definitely have been aware of. February 2014 saw the bifurcation of Andhra Pradesh into Telangana and Andhra Pradesh. 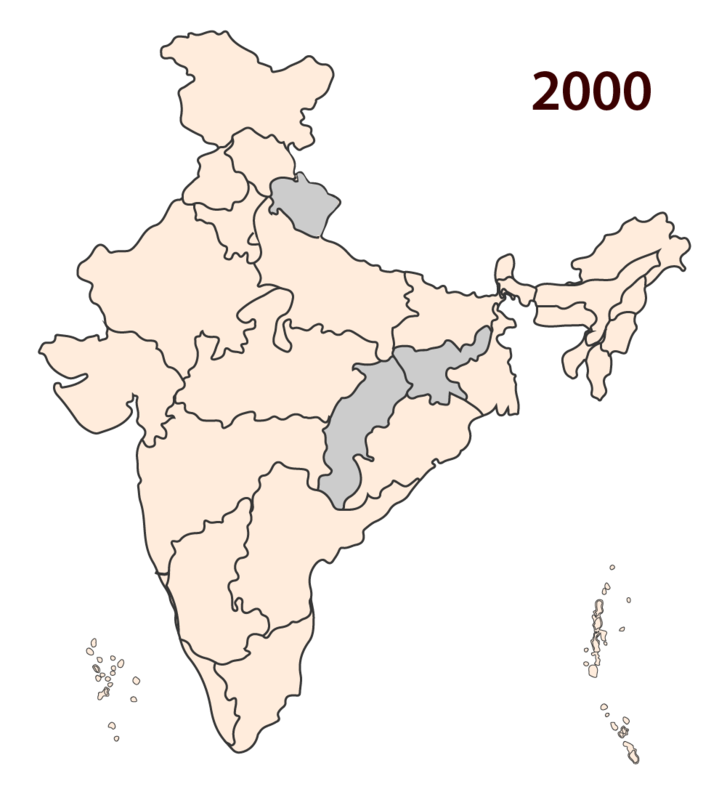 Unlike the bifurcations in the year 2000 when the state assemblies concerned passed resolutions recommending to the Centre bifurcation of the respective states, the 2014 bifurcation of Andhra Pradesh was carried out by Parliament exercising its supreme authority under Articles 3 and 4 of the Constitution. The state assembly actually had rejected the bifurcation law sent to it by the Centre. But bifurcation took place nevertheless because all political parties, barring the Communist Party of India (Marxist), were in favour of it. I have discussed this controversial episode at length in my book called Old History New Geography: Bifurcating Andhra Pradesh that was published in 2016. I had a role to play in this process and all I will say now is that it ended up pleasing nobody but achieving of what might be called “balanced dis-satisfaction” which is perhaps the best that can be hoped when dealing with such extraordinarily complex and complicated issues. 2014: Telangana is formed from Andhra Pradesh. On the night of February 20, 2014 after the Rajya Sabha had passed the Andhra Pradesh Reorganisation Bill, 2014 amidst bedlam, Arun Jaitley then Leader of the Opposition remarked to me that Parliament’s appetite for further reorganisation for states stands diminished. I remember telling him that were this to happen, it would be most unfortunate for India’s most pressing reorganisation is still pending and it is to this that I now turn. Uttar Pradesh is very much in the news and, as it so often happens, for the wrong reasons. With every passing day, evidence mounts that the reorganisation of India’s most populous state cannot continue to be ignored any longer. At present, Uttar Pradesh’s population of around 200 million would be the fifth largest in the world, on par with Brazil. The state’s population is expected to zoom to close to 420 million by the middle of this century. Today, Uttar Pradesh accounts for something like 16.5% of the country’s population and by 2050, this proportion could well be close to 25%. To put it bluntly, even with the most modern technology and with the strongest of political acumen and will, it is simply ungovernable. It is too big, too unwieldy to be run effectively. Internal devolution of powers to the 75 districts, 820-odd blocks and the 52,000-odd gram panchayats will make no difference whatsoever. “I, for my part, would be perfectly agreeable if there were a proposition that Uttar Pradesh, for instance, be split up into four provinces. However, I doubt very much if my colleagues from Uttar Pradesh would relish the idea; on the contrary, they would probably like to have an additional chunk from some other province”. And in his well-known book Thoughts on Linguistic States, Dr Ambedkar, called for the trifurcation of Uttar Pradesh on three specific grounds – enhancing administrative efficiency, reducing the disproportionate influence of such a large state on the polity and better protecting minorities from the power of a numerically preponderant majority community. Ambedkar also believed that the States Reorganisation Commission had quite unfairly focused on the reorganisation of south India while keeping the politically more influential north untouched. The States Reorganisation Commission did not recommend the division of Uttar Pradesh. But KM Panikkar penned a learned dissent note to the final report. He expressed great worries at the imbalance created by the disproportionate size of Uttar Pradesh and pointed to what he considered to be, in his own words, “the major and basic weakness of the Indian Constitution – the extraordinary disparity between one unit and the rest”. His proposal was for the creation of a new state called Agra in addition to another state of Uttar Pradesh. 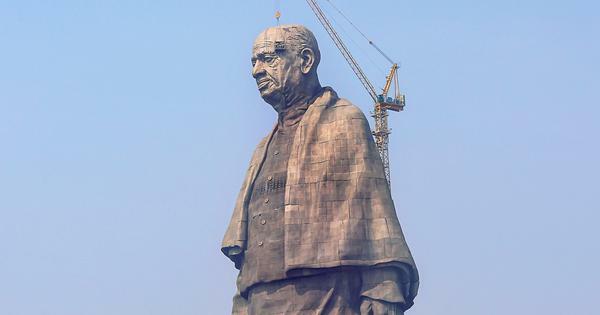 Bemoaning what he called “this unnatural feature of our Constitution, Panikkar wrote “that the unmanageable size of UP stands in the way of efficient administration”. But it was Pant who almost single-handedly ensured that Uttar Pradesh was not broken up. But he would also assert that he would not stand in the way of UP’s reorganisation, if administratively found necessary. According to Article 3 of the Constitution, consent of the state legislature is not a pre-requisite for its reorganisation. Parliament is fully competent to restructure state boundaries but it can do so only after the President has referred the Bill to the legislature of the state being reorganised for expressing its views. This is how Andhra Pradesh was bifurcated. In the case of Uttar Pradesh, the state legislature had submitted a proposal to the Centre for reorganisation in November 2011 when Mayawati was chief minister. Mayawati’s proposal was for dividing Uttar Pradesh into four new states – Purvanchal (Eastern UP), Paschim Pradesh (Western UP), Bundelkhand (Southern UP) and Awadh Pradesh (Central UP). If Andhra Pradesh could be reorganised by Parliament in its wisdom and that too over-riding the majority view in the state legislature, surely Uttar Pradesh – which has a more compelling case for such an intervention – could also be. The Indian state has responded creatively to demands for new states when it has not been found neither desirable nor feasible to accept these demands. Thus, for instance, a Bodoland Territorial Council was set up in 2003 in the state of Assam. The Gorkhaland Territorial Administration was established eight years later within the state of West Bengal. There are also Autonomous Development Councils within other states of Assam, Jammu and Kashmir, Manipur, Mizoram and Tripura. All these administrative structures have certainly helped contain agitations and have brought much-needed peace but to what extent the political and economic aspirations of the people of the regions concerned have been fulfilled needs to be examined dispassionately and corrective steps taken. A Second States Reorganisation Commission has been talked about but the two main national political parties have taken positions in its favour while in the Opposition but have soft-pedalled the idea while in power fearing that it would open up a Pandora’s box. My own position is that while a second States Reorganisation Commission needs to be debated, the reorganisation of Uttar Pradesh should not be postponed. Ladies and Gentlemen, Deshmukh’s exit from Nehru’s Cabinet was quite acrimonious. But the heat generated was soon forgotten and Deshmukh went on to become Chairman of the University Grants Commission first and Vice Chancellor of Delhi University later, both appointments being welcomed by Nehru himself. This, of course, reflected the politics of that era where people disagreed with each other, often bitterly, but did so without losing respect and fondness for each other personally. It is that spirit of give-and-take that has stood our country in good stead and that has deepened our democratic traditions. Now more than ever before, we need to rediscover and renew that spirit. Let me also say that while we applaud linguistic reorganisation that helped steer India through some extremely difficult years in spite of the fears of our founding fathers barring Gandhi, we must also rediscover and renew the wellsprings of cosmopolitanism and ensure that the safeguards for linguistic minorities are implemented in letter and spirit. Our states may be unilingual officially but our nation and indeed our society has been and should continue to be multi-lingual. Former Union Minister Jairam Ramesh is a Congress Rajya Sabha MP.